We started our adventure by flying in to Malaga and making tracks to our first stop; Marbella Old Town. 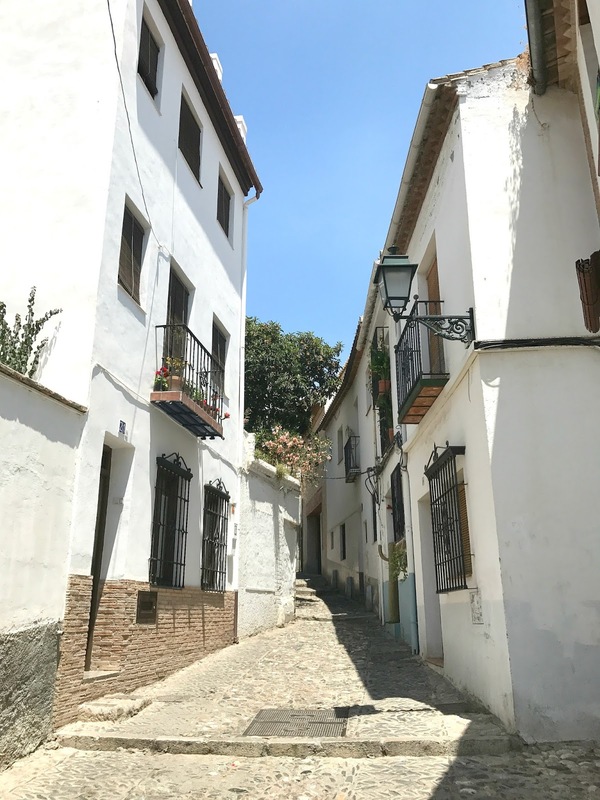 I posted last time about how this quintessentially Spanish town tore apart all our preconceptions of Marbs as the home of boozing extravagance, proving the perfect starting point for our Spanish holiday. After a couple of days we moved on to Iznájar for a friend's wedding - this time we found ourselves in quiet, rural Spain with gorgeous scenery and great company. Having a hire car was essential for this trip; we couldn't have got to Iznájar by public transport, and loved the freedom that having our own ride gave us! So the morning after the wedding (read: around lunchtime when we felt vaguely human again) we started on the next leg of our trip - an hour or so by car to Granada. A note on driving in Granada: the centre is restricted to cars, unless you are staying in the centre where your hotel can advise the police of your registration plate so no fine is incurred. It may be worth checking this out with your accommodation in advance. And driving into Granada was pretty gruelling; even Seville was far less hectic. 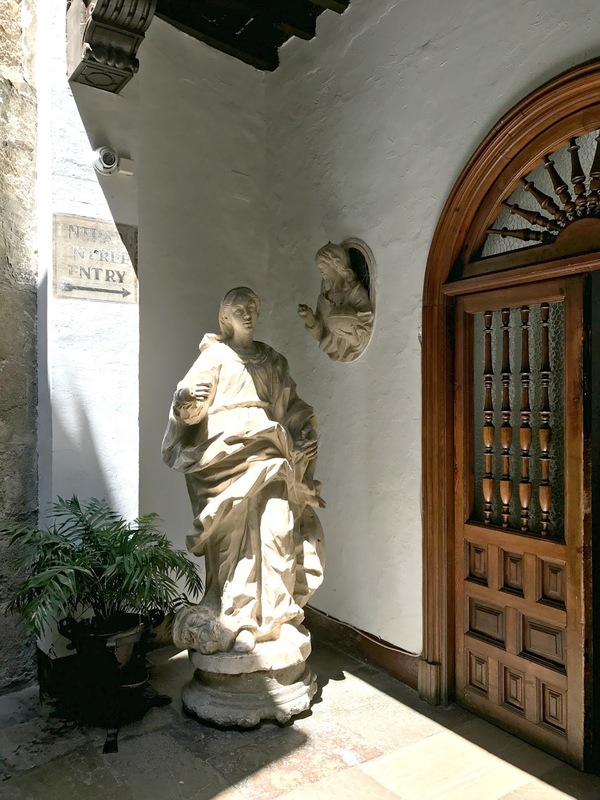 Right in the heart of Granada's historical centre, we spent two nights at Hotel Carlos V. A mid-range but fairly basic hotel, with clean rooms and more importantly in a great location. Just a ten minute walk from the Cathedral and five minutes from the tourist centre, it was perfect. They also offer parking at €15 a day which was well received after the trauma of driving in/around Granada! Our course no trip to Granada is complete without visiting the thirteenth-century Moorish Alhambra. Stunning architecture, divine details and breathtaking views - it is on a par with Cambodia's Angkor Wat, for me at least. I'll do a separate post on this one, simply because of the sheer number of images I have to share with y'all - watch this space! Be sure to book your tickets online in good time before you visit. 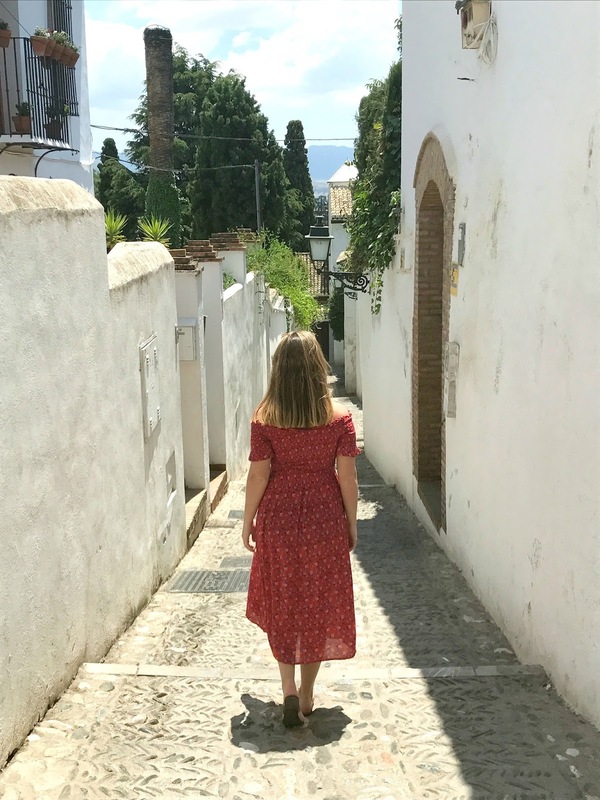 Get out of the centre and walk up to Albaicín (or Albayzín) for those picture perfect Spanish streets and amazing views over the Alhambra. Get lost in the winding streets and stop for a cerveza when the hilly paths get a bit too much, before heading to the Mirador San Nicolas for that view. Visit the Cathedral for jaw-droppingly beautiful architecture - and look up! Give yourself a good hour to explore, with the help of the audio guide which comes with the cost of entry (€5 for adults). Of the 'big three' we saw during our trip (Granada, Seville and Cordoba Cathedrals) this was by far my favourite. Stunning. Afterwards, enjoy a drink at Lío overlooking the square. Eat churros con chocolate for breakfast. Where else can you eat this pre-10am without feeling completely gluttonous? Grab a set outside Gran Cafe Bib Rambla and order yourself churros (half or full portion... go full) and a café con leche or zumo de naranja and watch the world go by. Perfection! Whilst we're on food, try out the tapas. If you're anything like me, it will thrill you to learn that Granada is one of the few main cities in Spain where you still receive a free tapas with every drink order... in most bars at least. And my oh my, is it blissful! Most bars have a menú del día, where with each drink you order you can work your way through the day's selection of dishes. Cost effective and completely delicious! Taberna La Tana - hailed as one of Granada's best and most traditional tabernas, there is an impressive wine selection with one lady on the bar who will shout at you to collect your tapas with each drink. Cosy and authentic, it is clearly popular with locals and tourists and as a result gets pretty busy - get there just before it opens for dinner (8.30pm) to try and get a small table or bar spot for the evening. The salted pork was delicious. Taberna de Jam - recommended by a friend and conveniently right next to our hotel, this place does incredible jamón. We ate so much cured meat during our time in Spain we now have thighs resembling said jamón, but I wouldn't change a thing! Gran Cafe Bib Rambla - the best churros in town, reportedly. They make a big batch in the morning and again in the evening, so get there early if you don't want to be disappointed. Dunk, eat, be merry. Taberna el Aviso - their 'house' tapa of grilled pork is so delicious we couldn't resist visiting more than once! El Conde - we stopped for a drink here (whilst waiting for La Tana to open, it's right opposite), and loved the mini hamburgers that came alongside - delicious and super cute. Restaurante Lío - another drink spot, but with a beautiful view of the Cathedral.